The 600km Celtic Link is expected to be completed in 2025 and will be used to transmit 700MW of electiricity between the northern European countries. EirGrid said the link would help the development of renewable energy in Ireland. According to RTE, independent reports said the link would prevent the need for a new gas plant in Ireland. The MoU moves the project on from five years of feasibility studies to the two-year initial design and pre-consultation stage, EirGrid said. The research will include investigation of proposed landing points and grid connection points. "It will improve security of supply on the island of Ireland and increase competition, driving down prices for customers," said EirGrid chief executive Fintan Slye. Ireland added 214MW of onshore wind capacity in 2015. The main obstacle to further growth is a shortage of investment in the grid and associated infrastructure. Ireland's wind resources are strongest in the west, where the population density is low and the grid at its weakest. Ireland is heavily dependent on importing electricity from the UK, but acutely aware of its need to secure its own supplies. This could boost wind power growth in the near future. 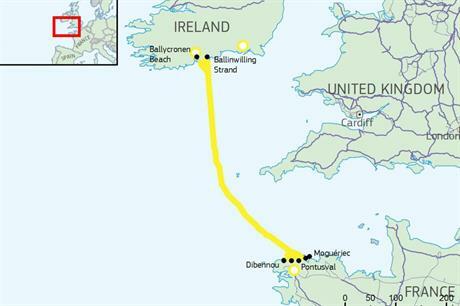 An interconnector between the UK and France, the 500MW Greenlink is being considered by the UK market regulator Ofgem after initially saying it had not demonstrated its cost effectiveness. Eirgrid manages the 500MW East-West interconnector between Ireland and the UK completed in 2012. France added almost 1.1GW of onshore wind in 2015, taking its total capacity to 10.4GW. It also has a 2GW link with the UK commissioned in 1986 with a proposed second link cable of carrying 1GW of power in development. Spain and France completed a 2GW link in April 2015.